By the end of the week, the University of Toronto usually goes quiet as students take a well-earned break. But the downtown Toronto campus was bustling on Friday evening as people came to listen to U of T researchers describe their work and its impact. U of T held 10 lectures in the Myhal Centre for Engineering Innovation & Entrepreneurship, starting at 6 p.m. and ending before 11. Among other topics, visitors received a crash course on what the humanities can contribute to the fight against climate change, how the forces of chance affect one's life and when we can expect robots to begin taking care of us. Scientists and policy-makers aren't the only ones who can help combat climate change, said Andrea Most, a professor of English, American literature and Jewish studies. “Stories matter,” she told a sold-out audience – especially those we tell about the environment. In light of alarming climate reports, Most said it's beyond time for a cultural shift that redefines people's relationship to nature. In the not-so-distant future, intelligent robots may lead to efficiencies in health care and help look after older adults. Goldie Nejat, an associate professor of mechanical engineering, has developed humanoid robots that understand speech and body language, and are capable of assisting with tasks like preparing a plate of spaghetti. In one of the festival's most popular sessions, Patricia O'Campo, a professor at the Dalla Lana School of Public Health, primed an audience on the social determinants of adult mental health. Precarious housing or working conditions, income inequality and other environmental factors all play a role in mental health, she said. 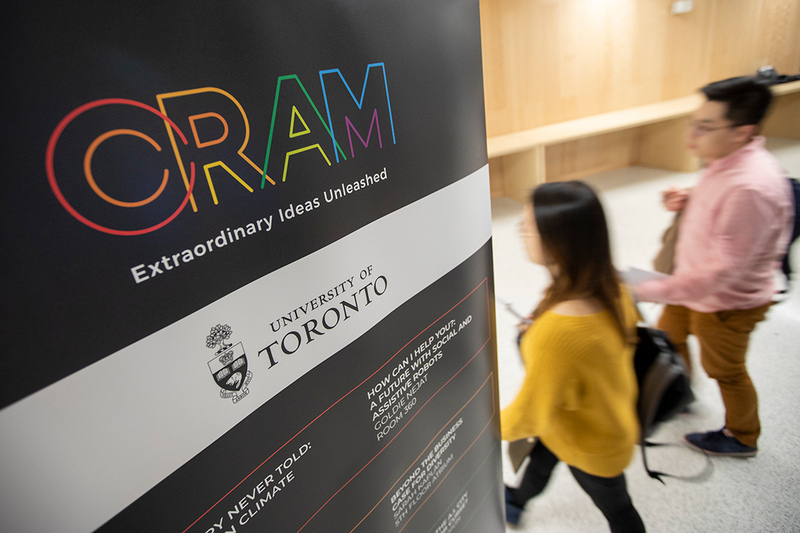 Faculty weren't the only ones getting their ideas across to the public at CRAM. There were also exhibits by undergraduate students on the second floor. Sarah Kaplan, a professor at the Rotman School of Management and the director of the Institute for Gender and the Economy, said new research suggests we can make faster progress by taking a moral and social justice approach to diversity. Researchers at U of T are known the world over for their prowess in artificial intelligence. But what will an AI-driven future look like and when will it become reality? Panelists Mark Fox (left), a professor of urban systems engineering, David Wolfe, a political science professor and co-director of the Innovation Policy Lab at the Munk School of Global Affairs & Public Policy, and Peter Wittek, an assistant professor at Rotman and affiliate of the Vector Institute, debated the issues with moderator Mario Grech, co-director and co-founder of the Department of Computer Science Innovation Lab, or DCSIL. If there was any consensus, it appeared to be that the future of AI will be what we make of it. “Will we let the technology run away with itself like social media has?” asked Wolfe. A man sitting in the front row laughs during a lighter moment in the AI panel discussion. People waited in line before the event trying to get a space at the popular talk. Jeffrey Rosenthal, a professor in the department of statistical sciences and author of bestsellers Knock on Wood and Struck by Lightning, spoke to a rapt audience about probability and the concept of luck. Sometimes, an event that appears to be a huge stroke of luck – such as the true story of strangers who met on a beach in Hawaii and turned out to be half-brothers – isn't as improbable as you might think. “I hope that attendees left with a better understanding of how to interpret random events when they encounter them,” Rosenthal told U of T News.